"The Horseshoe Crab Conundrum: Can We Harvest and Conserve?" by Jennifer Mattei, Ph.D. The Horseshoe Crab Conundrum: Can We Harvest and Conserve? Horeshoe crabs "Limulus polyphemus" are remarkable ‘living fossils’ which have unique blood cells (amebocytes) that are used to test human vaccines for bacterial contamination. In the 1950’s, scientists at the Marine Biological Laboratory in Woods Hole, Massachusetts, not only discovered amebocytes but also found that they had special properties. If the amebocytes came into contact with bacteria, they would instantly coagulate around the bacteria and attack it. The Woods Hole scientists took this unique property of horseshoe crabs and developed a test for bacterial contamination using a horseshoe crab blood derivative called Limulus Amebocyte Lysate (LAL). This article describes discusses the medical, economic, and ecological importance of the horseshoe crab. 'Project Limulus' is a research and community project which is working toward protecting the population of the horshoe crab. Reprinted from Wrack Lines, the official magazine of the Connecticut Sea Grant College Program. 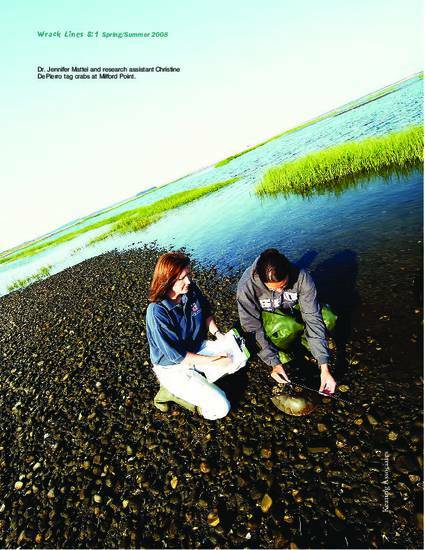 Biannual illustrated magazine with feature articles and brief items on coastal and marine topics with an emphasis on Long Island Sound and related activities at the University of Connecticut and beyond. Mattei, Jennifer and Mark Beekey. "The horseshoe crab conundrum : can we harvest and conserve?" Wrack Lines. 8.1 (2008): 2-7. Web. 5 Jul. 2012.